Tachi waza is mainly done katate (one hand) the other hand holding the reins of your horse or another weapon like the yari. 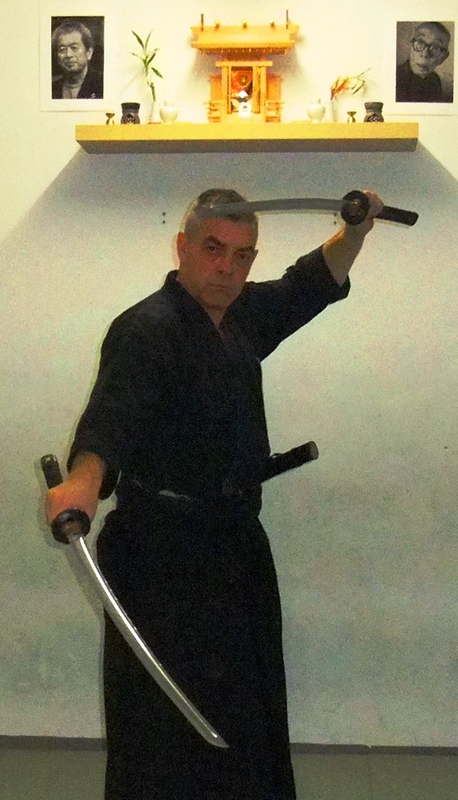 The two-handed grip was developed later with the use of the katana. Sometimes you can use the second hand to reinforce the momentum of your blade but it is not its general use. When riding a horse the left hand holds either the reins or the second weapon (yumi, yari, naginata) and the blows are given with the right hand only. In general, sensei said that you do not cut, or hit, nor crush with the tachi but that you should move around the opponent in order to stab through the openings of the yoroi. Tachi kumiuchi fighting is to understand how to stab the opponent who is fully protected by his yoroi by aiming at the holes in the protection opened by your actions. If the yoroi is the utsuwa (container) and the opening is kûkan (open space), don’t fight for the omote, but for the ura. In life, the invisible is more important than the visible. Become an artist and make the invisible visible! Thank you Arnaud for the “tips and tricks” series! It helps a lot in my training. I’m looking forward to experience your Tachi kumiuchi at the hungarian seminar!